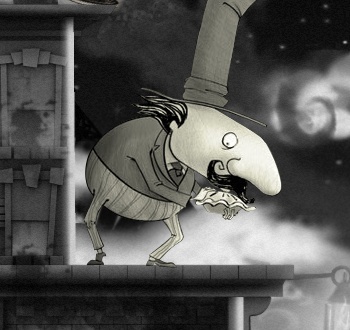 Graduates of USC game design school have channeled their love of silent films into a charming game. Certainly, videogames are no stranger to the bizarre and dreamlike; the medium will forever be in debt to a certain mushroom-chomping, turtle-hucking plumber. But Winterbottom's weirdness is a bit more studied. "I was a film major before I was at USC," says Korba. "I just love silent films, and I wanted to bring some of that charm into the gaming world. And I wanted it to be something that was simpler and tell a much simpler storyline that was humorous. Silent films captured that very easily." Independent games like Winterbottom are the perfect cure to the over-hyped game culture and I, for one, am looking forward to downloading it on XBLA. Read more about the Odd Gentlemen and their game in A Gentleman and a Scholar.